In this fourth volume, dedicated to the Greater ‘We’, ninety contributing writers and artists explore the social, techno, and ecological processes of diversification. 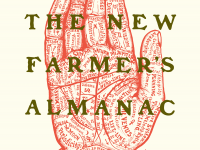 The New Farmer’s Almanac, Vol IV features essays and stories and poems from farmers, ranchers, ecologists, educators, food bank managers, grocers, gardeners, researchers, and advocates bound by their care for the land, the food system, and the survival of the natural world. Available January 30th!